Brian Avery of the International Solidarity Movement will be speaking in Santa Cruz on Sunday, March 14, from 6:00 to 8:00 PM at the Resource Center for Nonviolence (515 Broadway at Ocean in Santa Cruz). On April 5, 2003, Brian Avery was shot in the face by the Israeli Military while wearing a bright red jacket. When he raised himself from the ground, witnesses saw that his left cheek had almost been totally shot off. Brian was in Jenin as a volunteer with the International Solidarity Movement. The ISM is a Palestinian-led movement of Palestinian and international activists working to raise awareness of the struggle for Palestinian freedom and an end to the Israeli occupation. ISM utilizes nonviolent, direct action to confront and challenge the illegal Israeli occupation forces and policies. There will also be a showing of “Dispatches: The Killing Zone.�? Filmmakers Sandra Jordan and producer Rodrigo Vasquez reveal the shocking level of daily violence in the Gaza Strip. They arrived in Rafah right after the murder of Rachel Corrie. Tune in to Free Radio Santa Cruz on Sunday, March 14, at 3:00 PM for a live interview with Brian Avery. At 8.15am August 6, 1945, a nuclear bomb was exploded 500 metres above the city of Hiroshima. It is estimated 140,000 people, mainly women, old men and children, died directly and in the few months after the bomb exploded. Its effects can still be seen today in the survivors and their descendants. Saturday August 9 is the anniversary of the nuclear bombing of the city of Nagasaki. Historical research shows the use of nuclear weapons could have been avoided, and all those deaths prevented, if diplomatic alternatives had been properly pursued. The USA continues to use nuclear weapons of mass destruction, as in depleted uranium munitions, used recently in Iraq. ...inspiring, motivating, a call for the courage to act. Neighborly, fear abating, delineating the causes of violence including our own dietary habits. 60's retro, vanquished communal hippie dreams, sober look at how our drug-dazed young minds let those assasinations scare us away from politics. Kathy Kelly and Wade Hudson, two activists who experienced firsthand, civilian injuries and deaths, as well as the destruction of homes, hospitals and marketplaces caused by the US invasion and occupation of Iraq. Read what Metro Santa Cruz "didn't have room for." Debate: Sam Farr -- Bane or Boon to the Santa Cruz Peace Movement? When Sam Farr was first invited and then disinvited to speak at the massive peace rally on February 15, 2003 in Santa Cruz City Councilmember and UCSC lecturer, Mike Rotkin called Joe Williams and Paul Franklin of the Santa Cruz Peace Coalition "sectarian idiots." Joe Williams wrote a reply which was published in the Sentinel defending his actions. Meanwhile Congressman Sam Farr has wobbled between bad votes and good votes while still getting the enthusiastic support of Mike Rotkin. 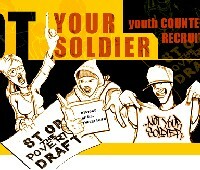 National "Not Your Soldier" Youth and Student Day of Action, Thursday November 17th at a high school or college campus near you.... Are military recruiters invading your schools and using promises of scholarships and career opportunities to convince your friends to join the military? You are not alone! On November 17, International Students Day, join youth and students from around the country in the first nationally coordinated day of action for and about young people! NOT YOUR SOLDIER! HELP STOP THE WAR MACHINE!! Colin Powell will be speaking at De Anza College in Cupertino (just north of San Jose on Stevens Creek Blvd.) three evenings in a row.